Spray 13x9-inch (3-quart) glass baking dish with cooking spray. In baking dish, layer half of the bread cubes, the broccoli, 1 cup of the cheese and the remaining bread cubes. In large bowl, beat eggs, milk and Alfredo sauce with wire whisk until well blended. Pour over ingredients in baking dish. Cover; refrigerate 4 hours or overnight. Heat oven to 350°F. Uncover baking dish. Sprinkle remaining 1 cup cheese over strata. Bake 45 to 50 minutes or until knife inserted in center comes out clean and cheese is deep golden brown. Let stand 5 minutes before serving. Alfredo sauce from a jar can be used in place of refrigerated sauce. 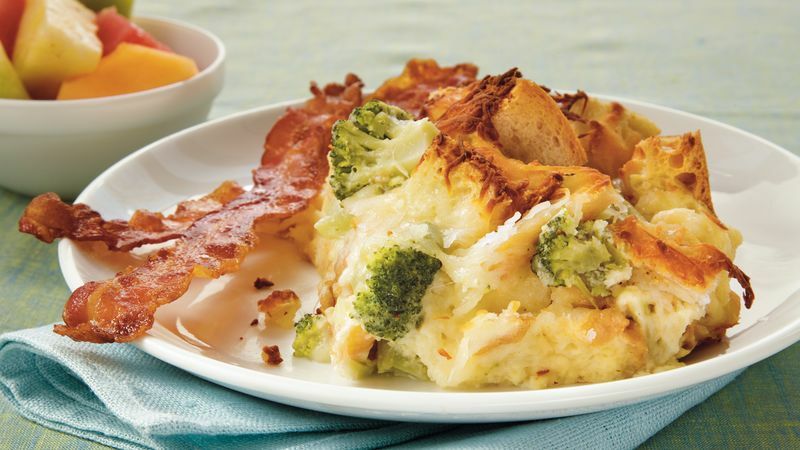 Recipe Variation Make-Ahead Alfredo Ham Strata: Add 1 cup diced cooked ham to the layers between the broccoli and cheese.